Soorma started on an average note on its 1st day at the box office. Today (Saturday), it’s the 2nd day of the movie starring Diljit Dosanjh and Taapsee Pannu. It successfully collected 3.25 crores from the domestic market. It is the second biopic film to be released in the recent times. 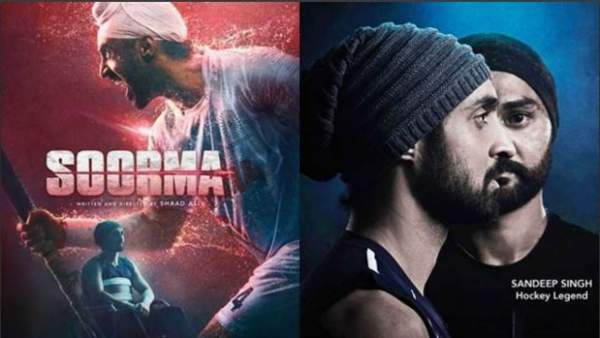 Soorma has been made on the life story of Indian hockey player Sandeep Singh. Before this flick, Sanju – the biopic movie of Bollywood actor Sanjay Dutt has been running at its best for two weeks. The production of Chitrangada Singh witnessed a slow start with just over 20% occupancy in the morning shows. Later in the day, it experienced gain in the footfalls and gathered momentum. After collecting 3.25 crores on the opening Friday, it is aiming for a substantial growth on Saturday and Sunday. According to trade analyst Girish Johar, Soorma got good word of mouth and thus, was able to do a decent business. It should be aiming towards Rs. 12 crores for the first-weekend collection. Johar said that occupancy in theatres will increase in North India on the 1st weekend. The reason being Diljit has a huge fan base as he is also a North Indian. The film was released on around 1100 screens. It should run heavily in Northern states especially Punjab, Haryana, and Delhi. It will be interesting to see how it performs in Mumbai and southern states of India. The film has received positive reviews and should be able to rake in more than 10 crores on these two days. Soorma also got released in Pakistan and has occupied nearly 80% of the Pakistani screens. It will also hit the theatres of Kuwait on Thursday. According to the director Shaad Ali, Soorma is not restricted to Indian audience rather it’s an inspirational movie based on the life of Sandeep Singh. Everyone can be inspired by the film. It recalls the Indian success in the field of hockey. Now, it all depends on the word of mouth which will eventually grow it or sink it. Sandeep Singh is also known as Flicker Singh. He met with a deadly accident and was on the wheelchair for years. However, the sportsperson made a smashing comeback and under his captaincy, India won the 2009 Sultan Azlan Shah Cup and qualified for 2012 Olympics.